Tonight the Elk Grove Planning Commissioner will hear and consider approving a significantly reduced plan for the unfinished shopping center formerly known as the Elk Grove Promenade. The shopping center, which had sat fallow since July, 2008, when the original owner abruptly stopped construction, has been re-branded as the Outlet Collection at Elk Grove. Because the project is in a special planning area, the current owner Howard Hughes Co. is seeking changes to the design and size of the proposed outlet shopping center. Among the changes being sought are the demolition of four structures, modification to nine existing structures, the addition of three buildings and the elimination of all department stores and retail superstores. With the demolition and addition of structures, the total square feet at the shopping center will be reduced to 750,000 from 1.1 million. The plans also call for the elimination of vehicle circulation within the core of the center and a reconfiguration of the parking lots. 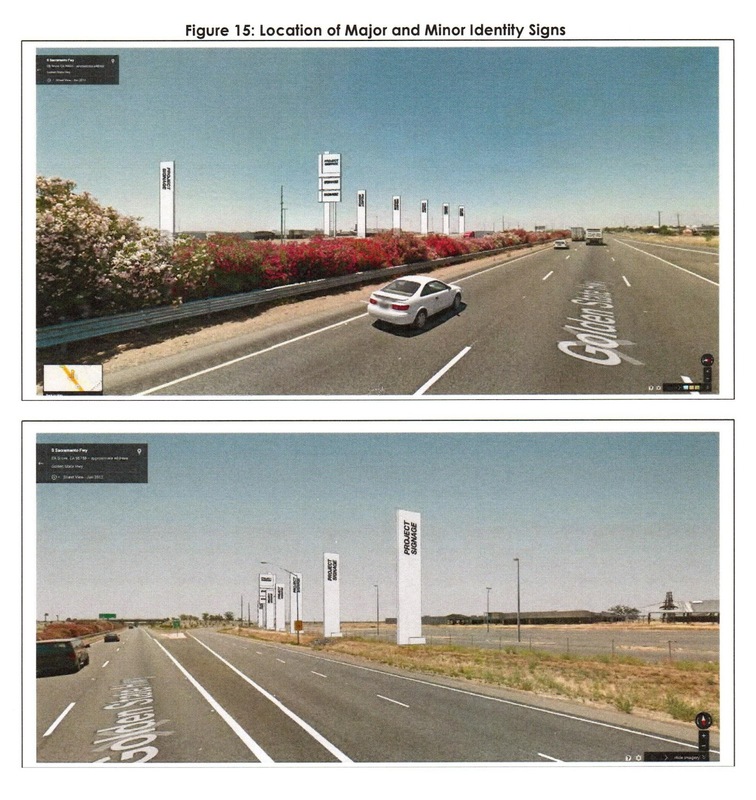 The plan is also seeking placement of 80' billboards to be erected next to Highway 99. Tonight's meeting starts at 6:30 p.m.
80' sign. Great idea! !...No, wait, let's make it 100'!...No wait.... Let's make it the tallest sign in the U.S., one that has to be built structurally sound taking into account the curvature of the earth. ...and let's build the world's largest McDonald's right next to the sign. We'll draw wonderful trashy people from all over the region that will spend their money here in Elk Grove. What a great idea! This city just amazes me with their innovative, cutting edge thinking. I heard this am from ma neighbor that the city may have breached their contract with the property holders of the mall property when they reconfigured the mall site. -I didn't see the meeting last night, but just goes to show that we really have no idea what we're doing. -I'll watch the PC meeting when it comes on line to see what we've done now that makes us look foolish. anyone out there care to elaborate and inform? Anon 7:42; A story will be posted on last night's meeting later this morning. Yes, the possibility of litigation was brought up during public comment last night. Yes, I heard that while watching the meeting last night, but will be anxious to hear from someone who has some legal expertise to work me through that. I wouldn't be surprised that EG didn't step in some dung heap...seems to be our pattern.